"It's hard to find a real Hungarian recipe for goulash. This is the real thing. 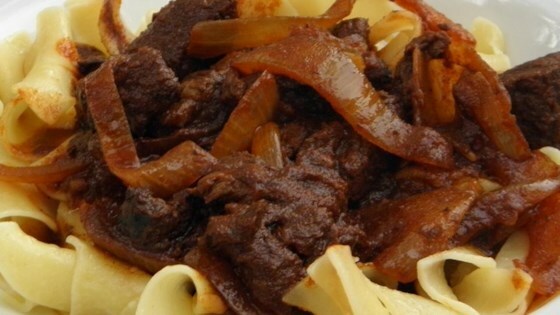 Real goulash has no tomato paste or beans. Eat with a slice of rustic bread. Dip bread in sauce and clean the plate with the bread at the end. Can be eaten with spaetzle." This was not for us at all, seriously lacked flavor. Excellent recipe! I browned the meat, then caramelized the onions with butter. I then transferred all with the remaining ingredients to my slow cooker and let it set for about 5 hours. Stuck to the recipe close except toward the end, instead of adding water or broth I added a cup of RED WINE. Hit the spot!! !